These are my absolute favorite cookies! I love them!!! LOVE THEM!!! 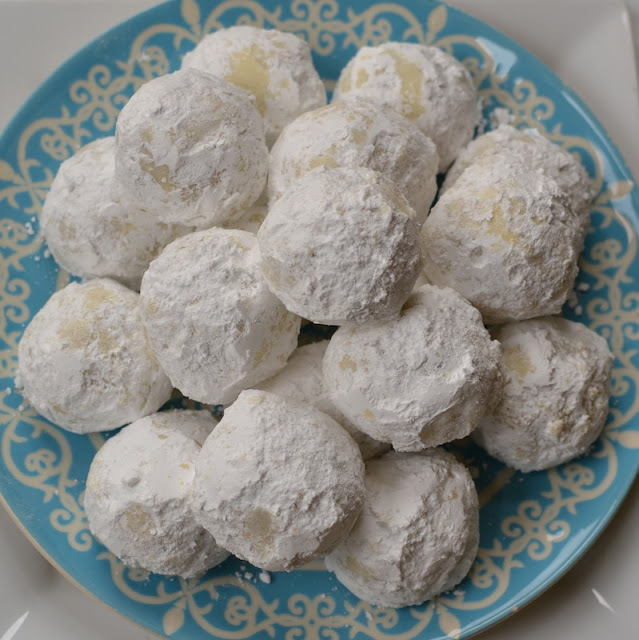 These Buttery Pecan Snowball Cookies aka wedding cookies or Russian Tea Cakes will melt in your mouth. They are so easy! You will find that you have a full batch of cookies ready in under 45 minutes. How can you beat that!! Look at those beauties. These Buttery Pecan Snowball Cookies are easy, quick to fix, DELICIOUS, and they freeze well. You may even have the ingredients in your house right now. They can be frozen ahead of time. I pack all my cookies in doubled Ziploc freezer bags and place them in sturdy glad-ware containers. When defrosting take them out of the containers frozen and place on serving trays or platters uncovered. Never allow them to defrost in the plastic and the containers. The condensation that builds in there will ruin the cookies. Remove from oven and allow to cool just enough to handle them. Pour 1 cup powdered sugar in large Ziploc bag. Gently add 3-4 cookies at a time and roll them gently in the bottom of the bag. Use fork to scoop under each cookie and gently shake to remove excess powdered sugar. Place on cooling racks. Once completely cooled roll in powdered sugar bag again. 0 Response to "Buttery Pecan Snowball Cookies"